A very charming entrance, I imagine a happy couple living there!I love the composition with sweet flowers and the stair is so clean ( with newspaper waiting for someone to catch it up)! 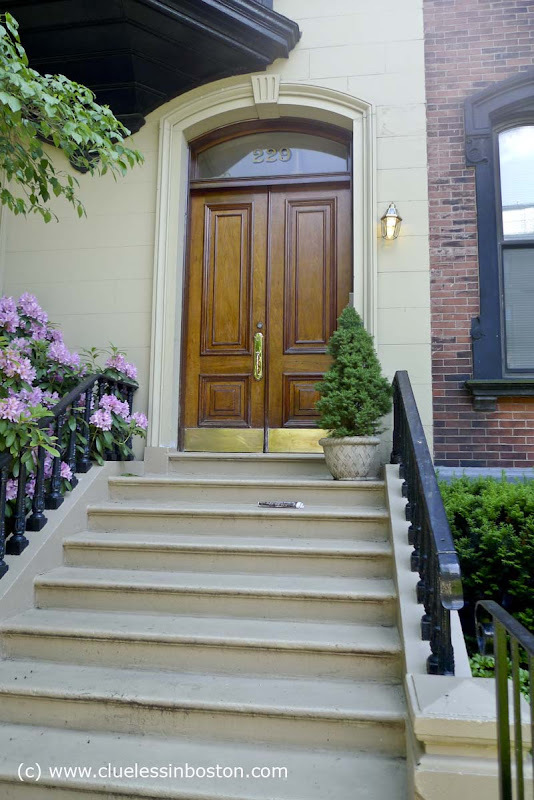 It seems that Beacon Street offers a beautyful rank of great doors; Would it be possible to have a view of the street, if one day you have time?.. Another beauty, is it the same newspaper I wonder? Another fantastic doorway of either "old money" or nouveau riche - I suppose, non? No. 229 Beacon Street looks like it would be very nice place to reside. This looks new. I am trying to think where on Beacon Street it might be. I remember another recent doorway with a newspaper on the stairs, wondering whether you thought about moving it for the image or left it for reality.